Experience this 'Man Made Wonder of the World ' with approximately 90 minutes to explore the sights and attractions on the top of Hoover Dam with an including the Visitor Center and the Generator Room Tour. This ranger guided tour takes you deep inside this National Historic Landmark to explore tunnels and view the turbines inside the dam. Guests will also have a view of the Hoover Dam from 900 feet above the Colorado River, as they walk the Mike O'Callaghan/Pat Tillman Memorial Bridge. Combine your Hoover Dam tour with an unforgettable Helicopter Landing beside the Colorado River in the bottom of the Grand Canyon. Guests who Choose this option will depart from Hoover Dam to board their Helicopter in White Hills, Arizona. Following the helicopter tour, guests will have a chance for a 'world class burger' at Last Stop before returning to the Las Vegas Strip. 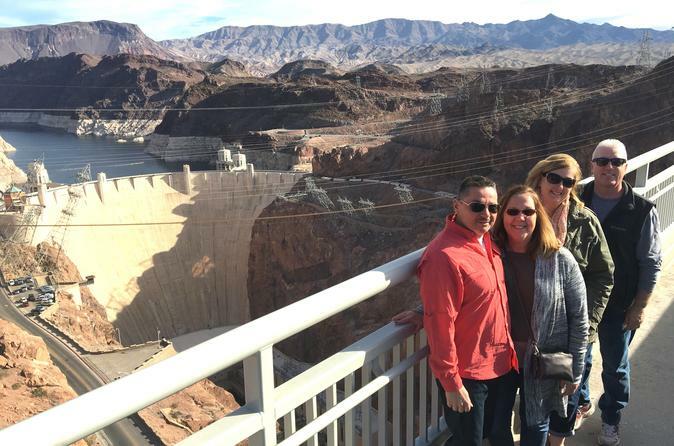 This tour offers you a couple of ways to see the Hoover Dam as well as an option to experience the Grand Canyon from Las Vegas. You'll be driven to the Hoover Dam and spend 90-minutes exploring the sights and attractions on the top of Hoover Dam as well as views of the Hoover Dam from the Mike O'Callaghan/Pat Tillman Memorial Bridge, 900 feet above the Colorado River. Your tour also includes the Visitor Center and Generator Room Tour of the interior of the dam. Your day will start with a visit to the famous Hoover Dam. This tour will offer a view of the Dam from the Mike O’Callaghan-Pat Tillman Memorial Bridge with great view from 900-feet above the Colorado River and Black Canyon. You will also have approximately 90-minutes to explore the top of Hoover Dam which includes the Visitor Center and the Generator Room Tour. This tour takes you through the interior of the dam with a trip 500-feet into the dam to view the turbines and the generator room, along with historical exhibits and the observation deck. After the time at Hoover Dam you'll travel to the Arizona side of the Colorado River to board their Grand Canyon helicopter at Last Stop, Arizona. This amazing flight offers 20-miles of flight through the Grand Canyon with a picnic landing just above the Colorado River. Total helicopter tour time is approximately 2-hours, with time for photos and the 20 minute picnic landing. You'll also be treated to a world famous Last Stop burger before returning to the Las Vegas Strip.